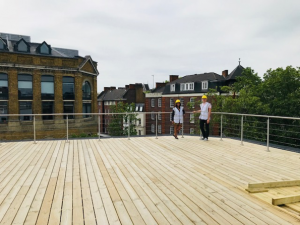 With the last stage of renovations set to be completed in July for Fordham’s London Centre in the city’s Clerkenwell section, project manager Peter Dunbar gave Fordham News the lowdown on the new space and its lively neighborhood. Offering study-abroad opportunities in liberal arts, business, and theater, Fordham’s London Centre had operated out of Heythrop College in the Kensington neighborhood for several years before outgrowing the space. The new 17,000-square-foot space will be central to the University’s commitment to global education. Dunbar is overseeing the renovations, as well as the interiors by the design firm Maris Interiors LLP. 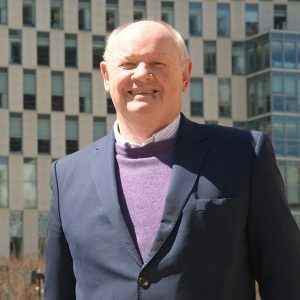 His firm, Dunbar Associates, has been managing construction projects for universities, investment banks, and hotels throughout London since 1973. Welcoming students this fall, the center’s six floors will house arts and sciences, theater, and business courses up to the graduate level. The ground floor will consist of a shared student space with a learning center and a small library. 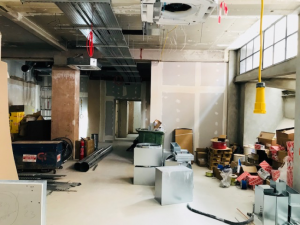 The first floor of the new building will be devoted to the London Academy of Dramatic Arts—long a cornerstone of the London Centre—with two large performance spaces. The remaining floors will hold seven classrooms, a conference room, faculty offices, and group study rooms. The entire ensemble will be topped with a roof terrace overlooking the lively neighborhood. What distinguishes the Clerkenwell neighborhood? Clerkenwell Road, where the center is located, is a cosmopolitan mix of industrial and residential buildings. There are graphics and high tech companies, showrooms, and a publishing house. It’s really in the heart of the action, but equally it’s on the fringe of the central business district, so there’s a lot of development going on around there. When we got the zoning changed so that we could use the building for educational purposes, there was an intimation that we would consult with and keep in touch with the local community. Fordham wants to immerse itself in the community, not just be an isolated entity. The area has a very eclectic feel about it. Students will have some interesting things to pick and choose from. Farringdon station is nearby, which will be a new Crossrail interchange with a great east-west link, so that’ll give a very rapid transit out to the airport at Heathrow. Equally, north-south you have the Thameslink going connecting nearby Kings Cross station to Gatwick airport. And then there’s St. Pancras International railway station, which means Paris is less than three hours away by train. What are the nearby neighborhoods like? Across the street is Leather Lane Market, where there’s street food and wine tastings. The new center is north of the City of London, which is the financial district. Nearby Holborn and Bloomsbury have a lot of classic Georgian buildings. The University of London and the British Museum are probably a 15-minute walk. Even closer is the City University of London. Just around the corner is Hatton Garden, the famous jewelry center where there’s plenty of diamonds and jewelry—if anybody’s interested. The building is a combination of three buildings originally. Fronting Clerkenwell Road there were two Victorian buildings, probably built for commercial use, not residential. They were combined a long time ago and formed the offices and manufacturing plant of a printing ink company called Winstone Printing Inks. Probably in the 1920s or ’30s, a north wing was added to create the building we are now refurbishing. That was occupied by Winstone, which made the inks for Fleet Street newspapers that were a mile down the road. So, the building has a bit of an industrial archeological history, though there’s not much sight of it now. Lower level windows allow for natural daylight. What’s the schedule for completing the renovations? We’re on schedule to complete the renovations at the end of July, so August will be move-in and time to set everything up, get the computers working, and get the networking up. 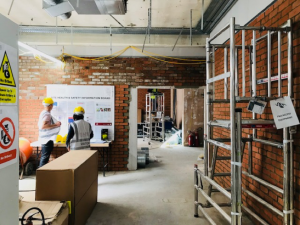 By then the London Academy of Dramatic Arts will have its stage set lighting, a combination of spots and strip LEDs so you can change the scene. A blacked-out ceiling also gives it a stage effect. 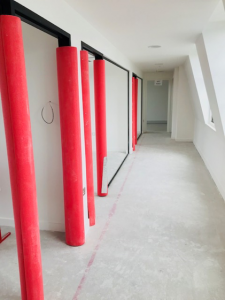 The ground floor entrance hall will have some interesting architectural lighting using copper tubing, which really has to be seen, describing it just won’t do it justice. The ground floor windows are nearly floor to ceiling height and will provide good visibility and daylight into the student center from the street. How will the building connect with the New York campuses? We’re working on the audio-visual and IT content for interactive screens, and teleconferencing for remote teaching. Professors and experts in London will be able to communicate with New York classrooms and vice versa. We’ll be all wired up across the Atlantic so if you open a door in London they’ll know who opened it in New York—without breaching any privacy issues, of course. The security system in London will be compatible with New York’s systems in terms of monitoring, so that the ID cards can work in either country.